Possess a positive attitude with the natural ability to provide excellent service working within a team environment, & dealing with people from all cultures. Accountable to the aircraft commander. Responsible to carry out the commander's instructions and assist him in the safe operation of the aircraft. Report any safety irregularities to the commander. Carry out pre-flight duties including checking the safety equipments on-board, ensuring the interior of the aircraft is clean, tidy and in an orderly manner. Educate passengers on the aircraft's safety procedures. Perform sales on duty-free goods, merchandises and food & beverages. Reassure passengers and ensure that they comply to safety procedures during emergency. Ensure passengers disembark safely at the end of the flight. *SPM with CREDIT in English or any subsitute credentials,pass in Bahasa Malaysia and one other credit in any other subject.Graduates from any disciplines are encouraged to apply.Experienced crews are encouraged to apply. 4.Recent resume & original and copies of certificates of higher education or equivalent. 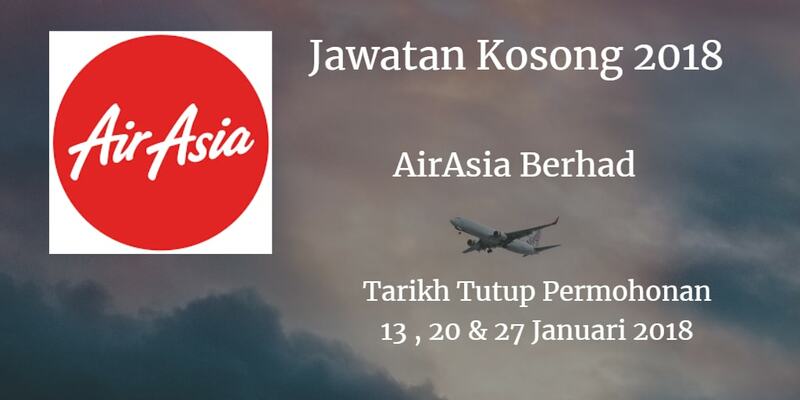 Sumber iklan rasmi jawatan kosong dan permohonan secara online sila layari laman web peluang Berkanun Pejabat Setiausaha Berkanun AirAsia Berhad disini.